Potosi senior Amber Udelhoven is batting .588 with three doubles, two triples, three home runs and 11 RBI through four games this season. 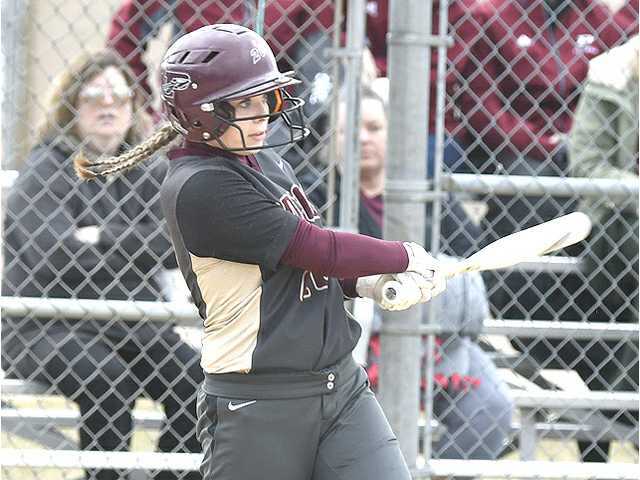 Potosi senior centerfielder Amber Udelhoven is off to a sizzling start to the 2019 prep softball season. Tuesday night Udelhoven had a career game, belting three home runs, along with a pair of doubles, and drove in a career-high seven runs to lead Potosi to a wild 25–21 victory over visiting Pecatonica. It was Potosi’s first win of the season as the Chieftains, who are without senior ace pitcher Jadyn Noonan to open the season, improved to 1–3. Udelhoven doubled and scored in the first inning as Potosi plated five runs. She hit a two-run homer in the top of the second to make it 7–4. After a ground out to third in the third inning, Udelhoven ripped a two-run double in fifth to pull the Chieftains within a run at 13–12 after the Vikings scored eight runs in the third. After Pec scored six in the bottom of the fifth to take a 19–15, Udelhoven tied the game at 19–19 with a two-run blast in the sixth, then led off the seventh to extend Potosi’s lead to 24–21. Udelhoven is batting .588 (10-for-17) with three doubles, two triples, three home runs, 11 RBI, 10 runs and three stolen bases so far this year. Berendes and Mowry combined on a five-inning perfect game in the Miner/Zephyrs’ 10–0 five-inning victory at Iowa–Grant on Monday. Berendes tossed four shutout innings, striking out eight batters without allowing a hit or a walk; while Mowry hurled a perfect fifth inning with two Ks. Hooper scored a goal and assisted on two others to lead the Platteville/Lancaster girls soccer team to a 5–0 victory over visiting Monroe in Friday’s season opener. The win avenged last year’s playoffs loss to the Cheesemakers in the WIAA Division 3 regional semifinals. Platteville/Lancaster outshot Monroe 27–2 in the match. Hooper had a goal and an assist in Monday's 4–2 loss at Portage/Poynette. Wernimont cleared a personal-best 12’6” to win the pole vault at Saturday’s Class B Madison West Indoor Relays to help the Platteville boys finish fourth at the 16-team meet. Last Tuesday, Wernimont cleared 11’ to finish third in the pole vault at the Pioneer Indoor Invitational at UW–Platteville. Willborn, the reigning Six River West Tri-Player of the Year, is already staking a claim for this year’s POY award. She is 4–0 with 39 strikeouts and just two earned runs allowed in 29 innings. She is also batting .5-for-13) with three doubles and four RBIs for the undefeated Braves (4–0). Willborn struck out 10 in Belmont’s 10–3 season-opening win at Platteville last Tuesday, then fanned 13 in a one-hit 8–0 shutout of visiting Lancaster last Thursday. She then helped the Braves knock off preseason SWC favorite Dodgeville, 4–2, Monday night, allowing two runs on seven hits in seven innings and most recently struck out 10 in a 7–2 38 (7victory at Iowa–Grant on Tuesday.